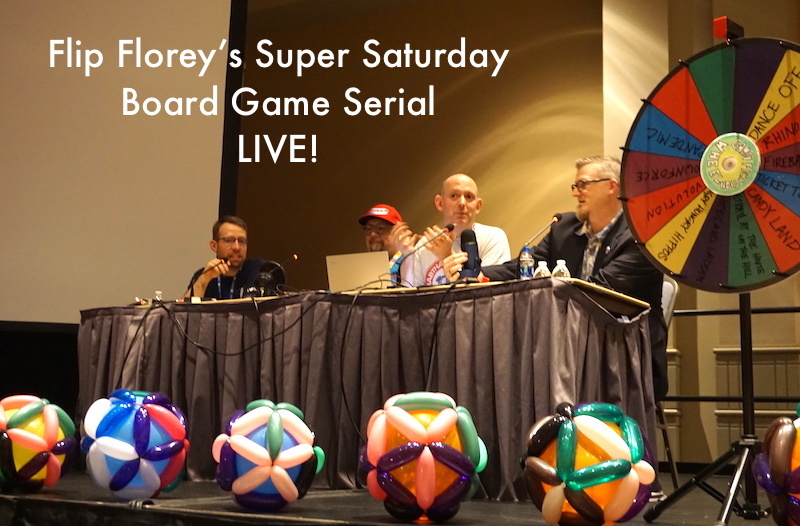 Anitra loved going to Flip Florey’s Super Saturday Board Game Serial – LIVE! Laid back but lots of fun. Flip had even made a lot of “20 sided balloons” and the gamification wheel made a real-world appearance. Andrew really enjoyed going to AEG, especially their upcoming game Tiny Towns. Gather resources and align them on the board to “build” various buildings. Make sure you leave enough space open! Wooden resource cubes and cute kid-friendly art. Anitra’s favorite game of the convention was ShipShape, an upcoming game from designer Rob Daviau and Calliope Games. Align punched-out grids over your ship’s “deck” to gain cannons, gold, and contraband. Obtain the grids by bidding high (or low) cards to get the appropriate grid from the stack. Andrew and Claire joined the TWIST gaming Twitch stream (fast forward to 1:23:30) and played Deep Sea Adventure. They had a lot of fun with Matt and Ann, even though Matt won. While they were at TWIST, Anitra and Asher were helping at the PAXU Family Gaming open house. Anitra mostly ended up teaching Sticky Chameleons, which was a blast. Also had a chance to play Rhino Hero Super Battle and see Unicorn Glitterluck. And a quick moment of Internet semi-fame; thank you to the listeners from Connecticut who recognized us! Andrew tried Stuffed from Certifiable Studios. He compares it to Steampunk Rally – except much simpler. Play as a stuffed animal hero; roll and place dice to collect gold, buy helpers, and complete a mission. Asher loved Fireball Island; especially flicking the ember marbles to knock other players down. His second favorite game was Beasts of Balance; stack the animals to build a tower – if it falls down, get 15 seconds to rebuild the tower so the volcano doesn’t explode! There’s also a battle mode for 2-3 players; cooperatively build the tower, but gain points individually and try to get the other player to knock the tower down. He dressed as Link from the Legend of Zelda, and PAX is one of the few places where he would be recognized by almost everyone. Claire also loved Beasts of Balance; especially the unicorn, the dragon, and the whale. 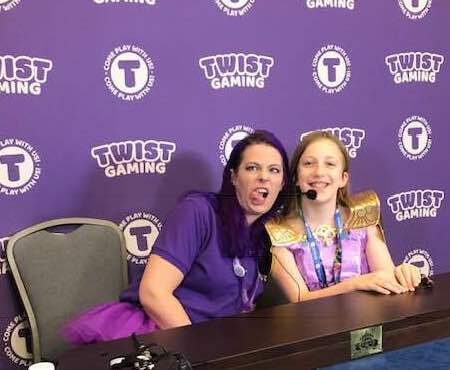 Claire enjoyed her time with TWIST gaming (and the panel with Flip and dad/Andrew). We’ve included timestamps for reference. Weird Things Humans Search For – A great party game, playable with kids down to age 9 or 10 (although there are a handful of cards you might want to remove for under 12). Cosmic Run: Regeneration – A space race requiring specific die rolls to advance on different tracks. Buy power cards (aliens) to allow you to manipulate your dice and improve your chances. Waters of Nereus – A medium-weight game set on a fantasy water-world. Lead your crew around the oceans to find treasure. All players pick crew (actions) simultaneously. Different crew have different special abilities, but require different treasure to pay them. A gorgeous game with art by Beth Sobel. Game to Grow is a 501(c)3 non-profit dedicated to using games for therapeutic, educational community growth. Mostly games like Dungeons & Dragons (and other RPGs) to teach social skills to kids and teens. Roleplaying games can really help kids on the autism spectrum or with ADHD or struggling with anxiety and depression. It gives distance from real-world consequences, but also lets kids identify with their characters and give them opportunities to grow. Find them at GameToGrow.org, also on Twitter @GameToGrow. Raids – Vikings sail across the sea to gather food, resources, and more Vikings. Fight monsters for more points. 40 minutes, 2-4 players. Legend of the Cherry Tree – A press-your-luck set collection game where players collect cherry blossoms in different colors and seasons. Create the most beautiful bouquet to have your wish granted. About 20 minutes, 2-4 players. The 8-Bit Box. The 8-Bit Box is the first “board game console” – all the games in the box use the same pieces. Pixoid is a programmed movement game, with players taking turns being Pixoid and the rest being ghosts trying to catch him. Outspeed is another type of programmed action game that simulates racing, where players avoid obstacles and try not to run out of fuel. Stadium is a game inspired by the Olympics; a team game to make it through various trials. Decrypto – a team game (3-8 players) to intercept clues to an encrypted phrase. Get your own teammates to guess the numbers without revealing the associated words to the other team. Ubongo (Fun-size edition for $15) – Ubongo is a real-time puzzle game for 1-4 players (or buy a second copy to play up to 8). Take pieces and fill in the given shape as fast as possible. Drop It – An eye-catching game with a vertical board. Drop your color piece into the drop zone and score points depending on how high it gets – but watch out, the pieces often bounce off each other! Imhotep – expansion “A New Dynasty” adds more player boards that can be used to change up scoring strategies. There are also “prophecy” cards that let you bet on achieving certain goals before the end of the game for extra points. EXIT kids games are planned to be released in USA soon. We can’t wait! Telestrations – celebrating its tenth anniversary! Snow White and the Seven Dwarves, A Gemstone Mining Game – For 3-7 players, ages 8+, it’s a reskinning of a game called “Quartz” from Passport Studios. The Snow White & Dwarves theme fits it perfectly! Fantastic Beasts Perilous Pursuit – a cooperative game where you try to capture the beasts from the movie. Fill up powers on the board by rolling dice, then use those powers to help you catch the creatures. If you fail to catch one, you’ll take damage. Munchkin: Harry Potter – play as different “levels” from the different houses. Blank Slate – A word-association game; match with at least one other player. Maximize your points by matching with only one other player. Junk Orbit – Become space garbage collectors. Some of that junk is used to propel you forward, the rest you are delivering to various locations around Earth, the Moon, and Mars. Hit rivals with junk to make them drop more! Full of science-fiction references and famous science/space facts. Gunkimono – “war tales” – an area-control, tile-laying game. Send out your troops (tiles) to control specific parts of the board, based on color. Connect large groups of the same color to gain lots of points and lock off territories. Simple to learn, nothing to read, but plenty of strategy. The Mind – this has been a controversial game this year. Try to sync up the numbers in your hand with those of the other players… without speaking. Play the cards in order from lowest to highest. Lose a life if you discard out of order; three failures makes you lose the game. Illusion – line up colors from highest concentration to lowest. Each card is a mixture of red, yellow, blue, and green with optical illusions to trick your eye. Can you get the cards lined up correctly? Check the percentages on the back of each card once you’re sure you’ve got it. Qwinto – roll up to 3 dice, and write the combined number on a row that matches the color of one of the dice. Duelsoar Island – the two-player, scaled down version of Dinosaur Island. Plays in less than an hour. Draft cards and use them to decide whether to place dinosaurs or attractions. Nyctophobia – a little dark for the family; one person can see the board, the rest are blindfolded and trying to avoid their piece on the board. Haven’t had enough PAX Unplugged content? There will be more in two weeks. But if there’s something you think we missed, tell us! See our new PodPledge and the hilarious video. Last but not least – a giveaway! Enter to win a copy of The Mansky Caper; if you win, we’ll get it to you before Christmas. The Exit kids games sound promising.